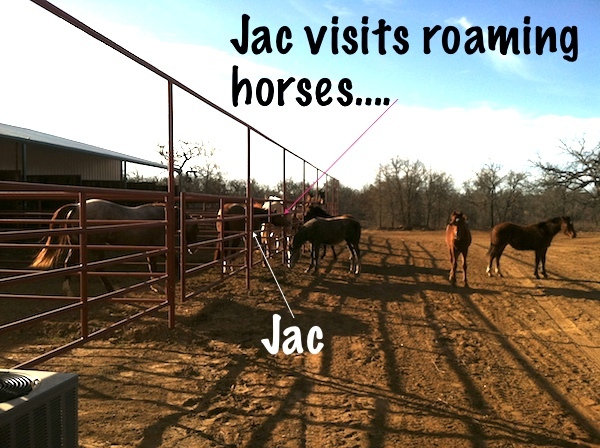 How is Jac doing with the move to Texas? Does Jac like Texas? It sure looks like it. HIs first day was exciting. He was shocked when a group of horses came wandering down the road and stopped by to say, “Hi.” The way the stall barn is designed is GENIUS! Mike designed it and I will have to do more photos but basically the horse have large stalls that open into runs. The cool part is that the back wall of the stall completely opens into the run, or completely shuts them into a stall. Also the ‘run’ has an overhang. Photos of that later. 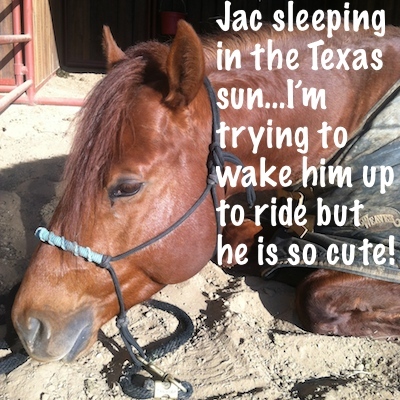 Yesterday, I went to ride and Jac was out in his run sleeping in the sun. I put the halter on but he was just content to sleep. Eventually he consented to a ride…he was very relaxed. Jesse video taped it and I will post it in the future. I still really enjoy the ‘horse wildlife preserve’ feeling around her. Will all 200 plus acres fenced it is neat to go ride and find horses. It is also just plain fun to see what horses with the freedom to roam do. Trying to sneak into the barn is always high on their list of activities…this still surprises Jac when they do get in, lol. Below is a video of what we frequently find when we come home. It was just getting dark and we came around a corner in the drive and…well, hit rush hour traffic in the driveway! ← When you are doing spiral in and spiral out, why do you have your hands so far out? I lived in Bowie for awhile and now I live a couple hours away. Would love to meet you sometime and discuss a few ideas I have for the Last Chance Corral. Thanks for spreading the word about that place, now it’s my turn. Love the Jac training videos! What horses do you have with you on your travels? Are there more photos of the barn set-up coming? Take your time finding a good place put down Root Stacey:-) ! What’s your favorite place to live? Still trying to figure that out! Jackie-yes, they are all cared for. It is like a horse wild life preserve where they are all cared for. So cute, the little girl who lives here went out on a 4-wheeler to find her horse…many are either young or trained and just roaming. It is really neat. Welcome to the real South. This is how our horses have lived for years. You’ll find we need to create shade not heat. The horses are much happier with this lifestyle. We also tend to do night riding to take advantage of the coolest temps. Hee Hee…… look at him stretching that neck out to say: “wanna nip??? I’m pretty good at it” …..
I’m surprised the snow… that is Texas, right?! That is how my set up is and I love it !!! I describe it as a stall/run in combo lol My horses can go from stall to small fenced in area or I open a gate and they have access to the pasture field. Which is nice if a storm hits while I am away they each know their own stall and go in….I personally just feel that horses aren’t meant to be locked in a stall and always worry about injuries from stalling…. So I only stall for illness…. Also cuts down the amount of poo you have to shovel lol I had a rescue that I had to stall 24/7 and I was like geesh this is a lot of poo…..